Historically herbs have been used not only to add flavor to food but also to preserve and for medicinal purposes. Another passion of mine is the use of herbs. I have started to research the use of herbs for digestion and anxiety and cold and flu. I struggled this summer to find herb plants to purchase locally for my garden so for next summer I will either grow the plants I want from seed myself or buy them organically online from a reputable grower. We had a fantastic year in our herb garden. Herbs are easy to grow plus animals leave them alone and they are virtually unaffected by insects. 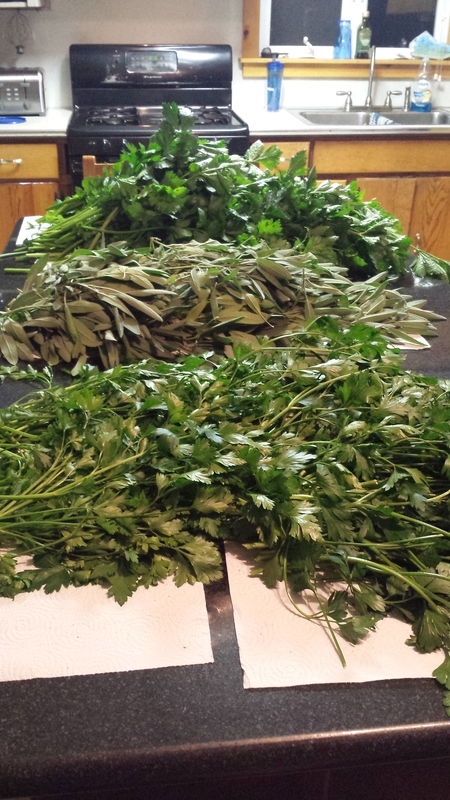 Last week I cut a huge amount of parsley, sage and celery from the garden. I don’t really consider celery an herb but this variety produces more leaves than stalk so I dry and grind the leaves into a powder and use the powder to flavor all kinds of dishes including soups. Take a look at my 6 foot island covered in what I cut. Keep in mind the amount of sage I cut was from one single plant and the celery and parsley were from only 6 plants. Wow huh?! It took me several hours to carefully look all the leaves over and remove them from the stems and clean them. About 6 hours in fact. But I enjoyed watching “Hot in Cleveland” on my phone while I picked. After the drying process in my dehydrators I ran all of the dried leaves through my mini chopper and got an entire quart of parsley and more than a pint of sage. I still haven’t finished the celery. I know you’re thinking I could have purchased dried parsley and sage from the grocery store and saved myself a lot of time and they wouldn’t have cost that much. Yep I could have. However those herbs wouldn’t be as fresh and Lord knows where those herbs are grown or under what conditions. I don’t mind the work. I enjoy it and other than the initial cost of a few bucks they are free. Also keep in mind I have been cutting the herbs all Spring, Summer and Fall and the sage is a perennial and the parsley reseeds itself. It’s definitely the gifts that keeps on giving. For me this is “Old Ways meets New Ways” because I produced my own herbs (old) and entertained myself watching “Hot in Cleveland” (new). I love Betty White. Do you preserve your own herbs? This entry was posted in Old Ways meets New Ways, Uncategorized and tagged celery, dehydrating, dried herbs, Gardening, Herbs, Hot in Cleveland, Old vs New, parsley, sage by marymargaretripley. Bookmark the permalink. 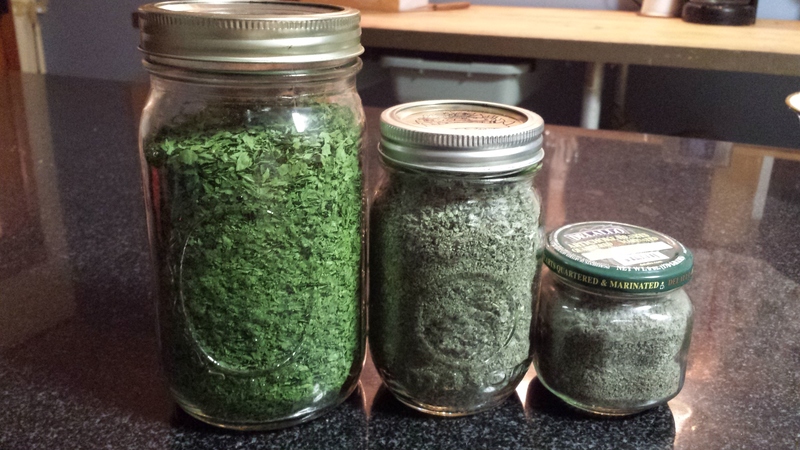 I’ve been growing herbs, drying them and making tinctures for many years. It’s a great hobby.